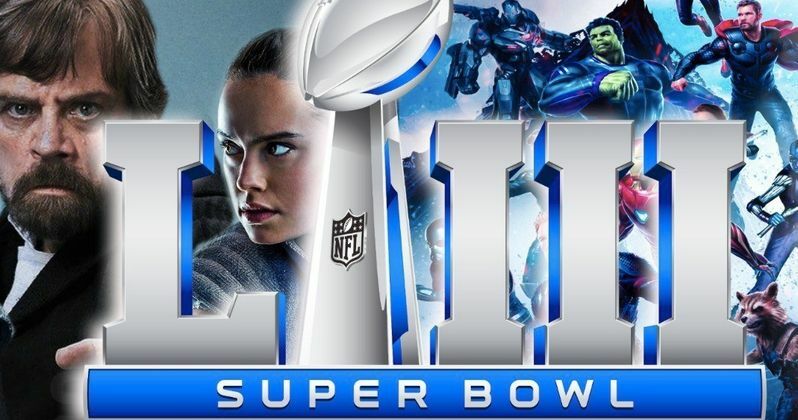 Disney Confirmed for Super Bowl, Will We Get Star Wars 9 & Endgame Trailers? It has been confirmed that Disney will have an "undisclosed" amount of TV spots airing during the Super Bowl next Sunday. This seems like a no-brainer, but it has not been confirmed until now. The big game is estimated to draw in at least 50 million households, which not only makes the ad pricing really expensive, but it's also when the big guns come out. One of the bigger properties that Disney may end up teasing is the highly anticipated Avengers: Endgame. The first Avengers: Endgame trailer premiered in December and many Marvel Cinematic Universe fans are hoping that Disney will release the first TV spot during the Super Bowl. Captain Marvel already has TV spots, but it hits theaters the following month, so it seems that Brie Larson's Carol Danvers could make an appearance as well. However, just the thought of an Avengers: Endgame TV spot will bring a lot of MCU fans into watching the big game next Sunday. Star Wars 9 is another one that would make for a huge Super Bowl commercial, especially since we have yet to see any footage from the upcoming movie. With that being said, we still don't have a title, which means that if Disney plans on releasing a teaser, we'll more than likely get the title reveal this week, though that has not been officially confirmed at this time. While seeing Star Wars 9 footage next Sunday would be really cool, Lucasfilm and Disney may want to wait to have their own big reveal at some point during the next year. Most likely at Star Wars Celebration in April. The movie doesn't open until December. Aside from Avengers: Endgame, Captain Marvel, and Star Wars 9, Disney has a bunch more huge movies coming out this year.Toy Story 4 is one of those projects and it hits theaters in June. So far, we have only seen some brief teasers, but Super Bowl Sunday seems like an excellent time to debut a full-length trailer in front of millions of families across North America. The live-action remake of Dumbo could also be shown, since it comes out at the end of March, but we have already seen quite a bit from the Tim Burton-directed project. The live-action remake of Aladdin could also be on that list since we were recently treated to a teaser. A big reveal of a blue version of Will Smith's Genie would be pretty huge on Super Bowl Sunday. Jon Favreau's The Lion King remake could also be one of the projects that Disney decides to show off after debuting the first teaser on Thanksgiving. And finally, Frozen 2 hits theaters in November, which means that we could see some footage of the sequel during the big game too. It's pretty amazing to see how much Disney is going to release this year, but what will they choose to promote next Sunday? The Disney Super Bowl ad confirmation comes to us from Ad Age.